Louis Ceccato, an outstanding Middleweight Class Boxer, was a Golden Glove Champion in 1934. Only a broken hand, in a qualifying fight for the Olympic trials, could slow him down. In 1958, Lou managed an Ontario boxing team that competed at the Canadian Boxing Championships and British Empire Games in Vancouver. At home in Niagara Falls, Lou not only participated in some of the biggest boxing events in our City, but he became a boxing event promoter, giving young fighters like Brian Kelly the public exposure and experience necessary to further their careers. Lou used his love of the sport to help teach and inspire boxers, and to give other people who shared his passion the chance to keep the sport alive in Niagara and across the country. This ‘Falls boy’ as the papers called him, was one of the smartest fighters of his time and one of the best referees in our area. He truly showed how love of sport can shape an entire life, and the lives of others. Lou participated on many championship sports teams that were sponsored by his employer Niagara Wire Weaving. Besides playing for the above teams, Lou coached the Niagara Falls Dynamo Football team of 1947, a team that won the Intermediate “B” Ontario Championship. 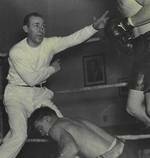 Louis Ceccato was a life long resident of Niagara Falls and made outstanding contributions in the field of athletics, as a participant, coach, referee and boxing promoter. In addition, Lou’s accomplishments inspired his children to become outstanding athletes and sports contributors in Niagara Falls.